Long-time readers of the site will be familiar with the work of Tyler Esposito - not only have we covered his excellent videos in the past, he's also contributed to Nintendo Life with an amusing look at one of the most bizarre NES games ever made. He also runs the excellent YouTube channel iretrogamer. Tyler's dad passed away a few years back, and has also been the subject of many of his heartwarming videos. Mark Esposito was an independent filmmaker who influenced his son in two ways - firstly, he got him interested in video games in a big way, and secondly he passed on his love of movies and movie-making. Back in 1983, Mark produced a short film which aimed to fuse the worlds of classic horror movies with new-fangled video game culture. The result was Treasure of the Haunted House, a short movie starring comic Max Alexander in his first role. 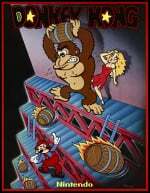 The story of a tragic character who badly wants to beat the latest video game at his local arcade, the short involves a spooky dream sequence where the hapless lead creeps around a haunted house, taking out various famous movie monsters with a range of colourful weapons - one of which happens to be the iconic hammer from Nintendo's Donkey Kong - one of the biggest games of the era. Tyler has had the original movie in his basement for a while, and decided to upload it to YouTube in time for Halloween. The short has a quirky quality and manages to capture the feel of classic horror films as well as incorporate video game references, such as beeping sound effects and weapon pick-ups - things that back in 1983 would have seemed quite fresh and new. Give the film a watch and let us know what you think by posting a comment. That was interesting to watch, love how you can't seem to move to the sword to start the game. It remember me the movies of Chabelo and Pepito vs the monsters. This is a really good short and I'm sure very inspirational for its time. I'd love to see more short films crafted in this style with the lack of dialog and relying on emotive story telling. It kind of mimics the games of its time in that the player would feel the anxiety of a situation through unspoken, high-tension gameplay... especially on an arcade machine where the dip-switch difficulty was usually ramped up and every quarter mattered. I wonder if "Treasure of the Haunted House" was actually a working game, a prototype, or just a couple of screens they strung together. I'd like to play it! @Deadstanley It looks like the game/mockup was done on a computer of the day, something pre-Commodore 64 even. So if it exists as a game, then it would be on that computer rather than an arcade game.